Can you believe that after Friday the holidays will be officially behind us? It all went so fast! For those of you who weren’t able to hit all the holiday events and activities you were hoping to, you’re in luck, because most of the local light and train displays run through Sunday. Additionally, for those of you who are pooped out on the holiday hoopla, we’ve got a couple of ideas for you as well. As always, if you know of an event happening this weekend that you’d like to share, please feel free to add it to the comments! Don’t forget, we’re currently doing a reader survey. Take two minutes to tell us about yourself and you just might win a $25 Over-The-Rhine gift certificate thanks to the nice folks at OTR Gateway. The gift card is good for more than 20 venues in Over-The-Rhine including Park + Vine, The Ensemble Theatre,Venice on Vine, Lavomatic & more! Take the survey now. 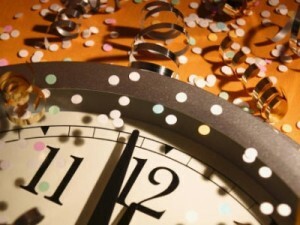 Looking for the best way to ring in the new year with your family? 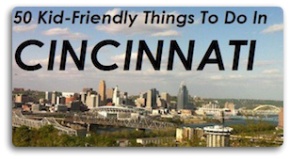 Check out Susan’s post from earlier this week on Cincinnati New Years Eve Celebrations for Families. Includes activities with Happen Inc, the Boone County Library and more! Also, we just discovered that Cheers to Art in Maderia is hosting an Open Studio on New Years Eve day for kids. Cost is $25 & $20 (Kids under 12), reservations not required. Session run from 11am – 4pm. The Christmas Ranch – The Gift of Lights – Located in Morrow, Ohio, this is a walk through light display that features over 350,000 lights. Check it out Friday night from 5-10pm. Admission is $12/car and $1.50/passenger in a bus with a minimum of $15. They have wagon rides ($4) and photos with Santa. Call (513) 697-2640 for more information. Quick! If you have not checked out the Holiday Train Display at Duke Energy downtown, Friday is your last chance. Hours are 10am – 6pm. Saturday head to the Duke Energy Children’s Museum for “Where in the World: Cup of Unity. ” Participants will learn about one of the Kwanzaa traditions – Kikiombe cha Umoja, the Cup of Unity. Starts at 2pm. 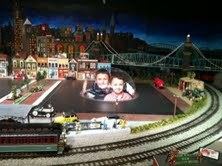 The Holiday Toy Train Show at the Behringer Crawford Museum continues through January 16. The cost is $7 for adults and $4 for children. Hours are Friday 10am – 5pm and Sunday 1pm – 5pm. Read all about it in Katie’s post. PNC Festival of Lights – The Cincinnati Zoo & Botanical Gardens – This is one of the premier holiday light displays in the region. There is always so much to see and do. Open through January 2 from 5pm-9pm. Admission is included with your Zoo ticket purchase ($14/ages 13-61, $9/ages 2-12 and Seniors (62+). Pyramid Hill’s Holiday Lights on the Hill in Hamilton is open every night through Jan. 2, 6pm to 10pm Friday and Saturday, 6pm to 9pm Sunday. Light Up Middletown has a great drive-through holiday light display at Smith Park. It’s open Friday from 6pm to 10pm. Holiday in Lights at Sharon Woods is open Friday & Saturday from 6pm to 1opm. Light up the Levee Holiday Lights Show – Visit Newport on Levee for their free holiday light display set to festive holiday music. Enjoy the show every 20 minutes beginning at 6:10pm – 11:50pm nightly. Open through Sunday. Sunday head to the Winton Centre at Winton Woods for Nature Bingo. Tasty hot chocolate and treats provided. No cost to play, but you must have a vehicle permit. Bingo starts at 2pm. In the mood for a movie? Sunday the Durr Branch of the Kenton County Library hosts Movies: Two Thumbs Up! Starting at 2pm patrons can watch “The Importance of Being Earnest,” rated PG. Free to attend. 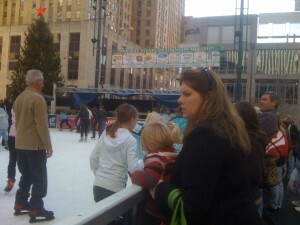 Ready to ice skate? In addition to heading down to the Fountain Square Ice Rink, check out the Goggin Ice Center at Miami University on Sunday. Open from 3pm – 5pm & 6pm – 8pm, skating is just $5, which includes the skates! Check out the Miami University website for details. Finally, be before you ring in the new year, on behalf of Amy, Susan, myself and the whole FFC team, we thank you for your support over the past year and look forward to an even better 2011!